In sports, everyone is a winner—some people just win better than others. Like people who can't decide which Durham-area basketball team they hate more. The Tar Heels or the Dukies? Now it's easier than ever to do both! For the first time in seven years, North Carolina and Duke both lost on the same day. How delicious. The Blue Devils suffered a somewhat embarrassing 14-point loss at NC State that somehow leaves them two games behind ACC-leading Virgina. Yeah, you heard me. Virginia is leading the ACC. (They've played two fewer games than everyone else, but still. Undefeated in conference play!) It just keeps getting better and better, doesn't it? 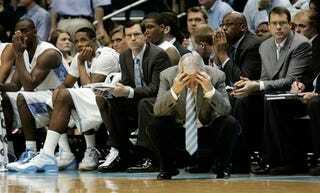 Speaking of nationwide embarrassments—what is up with the Tar Heels? They got creamed by Wake Forest at home, giving Roy Williams and his monstrous pinkie their first three-game losing streak since moving to Chapel Hill. UNC is in 11th place(!) in the ACC. Imagine that! Any of the 12 teams who lost to them this season must feel pretty stupid right now. So there you go. The state of North Carolina (not counting the North Carolina teams that beat those first North Carolina teams) has received its long awaited comeuppance! Also UTEP ended Memphis' 64-game conference winning streaking, preventing them from breaking the NCAA record. It's a glorious morning for hoops schadenfreude. Treasure these memories. Honorable mention: Conan O'Brien. Things will never be better than they are at this moment. Treasure these memories.